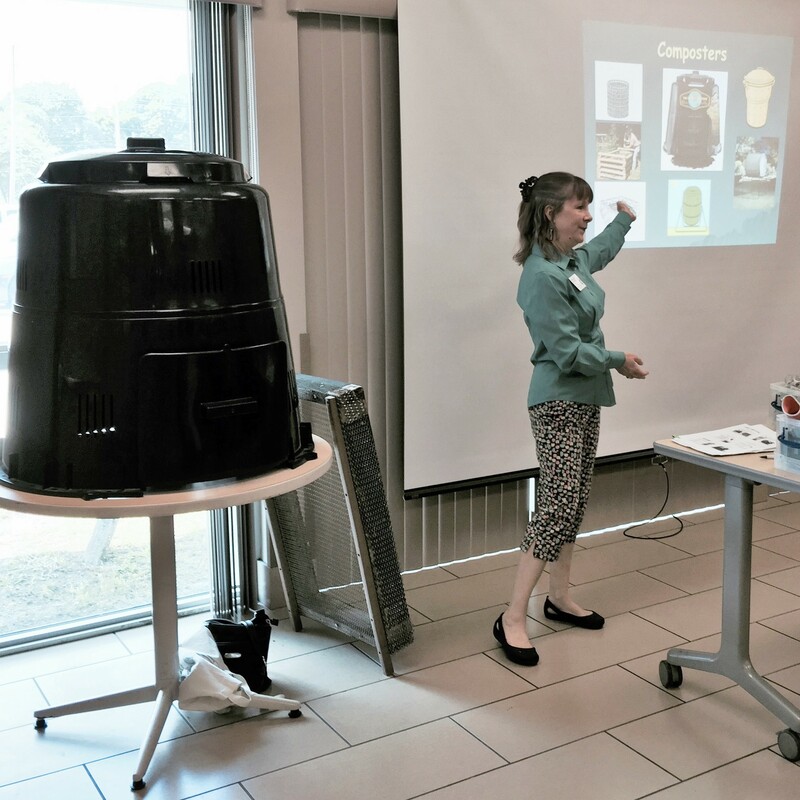 Saturday morning I attended a 1-hour composting workshop taught by the University of Florida, Miami-Dade County Extension. They gave me and each of the 50 participants a free composter: The Earth Machine. The plastic bin is only 33” high by 33” wide, so it can fit unobtrusively into most yards. If you don’t know what compost is… it is the decomposition of organic waste such as food and/or plant material by microbes, worms & other organisms. The end result is humus, a rich material that you can use to fertilize your plants or enrich the soil. (Not to be confused with Hummus!) It’s very easy to make compost. They suggest that you use 1 part GREENS to 3 parts BROWNS, though this is not a definitive rule. GREENS can be cooked/uncooked fruits & vegetables, breads & grains, coffee grounds & filters, and grass clippings. BROWNS are sawdust, hay & straw, wood fireplace ashes, yard trimmings (leaves, twigs), used potting soil, wood chips, shredded newspaper, eggshells and nut shells. As you fill the bin with your waste material, you should keep it moist and mix it up every now and then. In 4 to 6 months you will have a batch of rich compost. I have one, exactly the same as pictured. However, the compost attracted moles to my yard, and tore up my lawn. Sadly, I had to stop composting. 😕 The bin is still sitting at the corner of my backyard. If anyone has any ideas about how to prevent it from happening, please let me know. I hate to throw all those good stuff into the thrash. Sorry to hear that. Perhaps you could try a tumbler that is off the ground. I have one and it hasn’t attracted any pests. I was doing mine in a difficult to handle and not too efficient way, and I just bought a tumbler that I can handle. Compost for the garden will be better next year. This thing sounds interesting. I also have a tumbler, and took out compost from it for the first time today. I am using the Earth Machine mainly for leaves and yard trimmings. Will you let us know how it works? Thanks. New ideas are always good, and anything to make things easier. Good luck!